Brimming with haunting Druids and Deathly Romans, Britannia reaches deep into a land quaking with tension. When the Romans arrive to the island of Britannia, ruin and mass devastation are soon to follow. The rivaling tribes of Cantii and Regni find themselves trapped in a web of Roman deception and Druid mutterings from the Gods. Lurking behind it all is a prophecy of devastating proportions in which everyone will soon find a place even a small girl from the first village the Romans laid siege to. 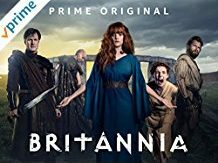 Britannia is sure to lead you on an eerie adventure into a realm of deep seeded anxiety as the plot unfolds in a tangle of deceit. Just be warned it does not shy away from showing blood and gore.